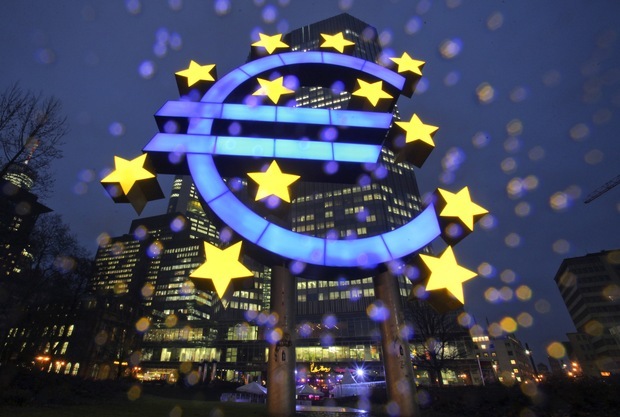 A euro sign sculpture stands in front of European Central Bank (ECB) headquarters in Frankfurt, Germany. Photo via Getty Images. By Paul Solman and Elizabeth Shell. Follow all of NewsHour’s coverage of the eurozone financial crisis here. The 17-country monetary union known as the eurozone finds itself on precarious footing 13 years after the currency came into existence in 1999. European countries drowning in debt. Governments enacting austerity programs. Unemployment rising. Ratings agencies downgrading government debt. Citizens turning over governments that have scaled back financial reforms that cut into social programs. Finance ministers, central bankers and heads of government trying to determine to bail or not to bail out countries in order to keep things from spinning out of control. Nearly 332 million people live in the eurozone, and what happens there ripples through the European Union and the rest of the world in varying degrees of severity, affecting exchange rates to car prices to retirement funds. I’ve reported and tweeted at length about the crisis, including what it could mean for the global economy, what might happen and whether or not the United States will follow in the eurozone’s footsteps. However, those of you familiar with my work will know I take a Galbraithian angle on prognosticating the future: I know that I don’t know. Athens is besieged by riots, because ordinary Greeks understand what their leaders won’t admit. The reforms imposed by Angela Merkel and Greek creditors will delay but not avoid a sovereign default. Those won’t solve the nation’s chronic economic problems, and ultimately will cause the ruin of Europe’s most ancient civilization. At issue are the conditions imposed by Germany and other rich European nations, the IMF and European Central Bank, and private creditors in exchange for an aid package and deal to cut Greek government debt in half and avert a sovereign default in March. These draconian budget cuts, including some 150,000 government jobs, a 22 percent cut in the private sector minimum wage, and other reforms are intended to make the Greek economy more competitive, attractive to investment and ultimately capable of repaying its remaining debt. In addition to assent from the sitting Parliament, Germany and others are demanding that opposition political leaders pledge not to seek to renegotiate these terms if Greeks vote for a change in government. Essentially, led by German Chancellor Angela Merkel, Greece’s creditors are demanding that Greece become a German protectorate, deprived of democracy, or it will be let to default, treated as a pariah by the EU, and impoverished. Not so long as Greek is stuck with an overvalued euro instead of its own drachma, which can easily be devalued to make its exports (and tourism) much less expensive. The stakes are enormous-unemployment could easily rocket above 30 percent in Greece for years. With the government having with no real means to ease the pain, revolutionary conditions will prevail. Even now Greece is little more than a barn full of straw in the middle of a summer drought. Yet, in a fit of Teutonic arrogance, Merkel is demanding, even if the aid package and reforms fail, no negotiations with a future Greek government-no turning back even if Greece risks sinking into state entropy and chaos. In the street of Athens and other cities, citizens are rioting because they understand the folly and injustice of this deal. Morici is a professor at the Robert H. Smith School of Business at the University of Maryland and former chief economist at the U.S. International Trade Commission. All along, my NewsHour colleagues and I have been covering the crisis, and we will continue to do so. For a full compendium of our reporting on the eurozone’s financial crisis, click here.